Who, where, when: Army (2-7) at Rutgers (7-1, No. 24 AP, No. 20 USA Today), Saturday, noon. Gambling is illegal in most states: Rutgers is a 17-point favorite. Momentum shifts: It’s the old story of two teams going in opposite directions, but not the directions you’d expect. Army lost six of seven games before beating Air Force at home 41-21 last weekend, putting itself in contention for the Commander in Chief’s Trophy and possibly turning around a depressing season. Rutgers entered its Oct. 27 game against Kent State with an unbeaten record and a head of steam for the Big East Conference stretch run; a 35-23 loss didn’t change the conference standings, but it nearly dropped the Scarlet Knights out of the polls and sent them into a bye week with plenty to think about. Super Nova? : That’d be Gary Nova, the RU sophomore quarterback who has thrown for more than 1,800 yards and 17 touchdowns this season. He’s coming off a rocky performance against Kent, throwing a team-record six interceptions to offset 313 passing yards and two scores. Rutgers has four receivers with more yards than Army’s leading wideout, Chevaughn Lawrence; sophomore wideout Brandon Coleman leads the Scarlet Knights with 450 yards on 31 catches. Army’s defense will need a complete change in focus, from Air Force’s option attack to Nova’s air assault. About that option…: The Rutgers media folks go as far as calling Army’s attack “the vaunted triple option” in their weekly game notes. “Vaunted” might be pushing it — Rutgers is 10-2 in its last 12 games against Army and Navy option offenses. While Army’s first in college football with more than 375 yards per game on the ground (34 or so higher than second-place Oregon), Rugters’ run defense is fourth nationally, giving up less than 90 yards a game. The Scarlet Knights are also in the top 10 among scoring defenses, and their takeaways have led to a 1.13 turnover margin, 12th-best in the nation. 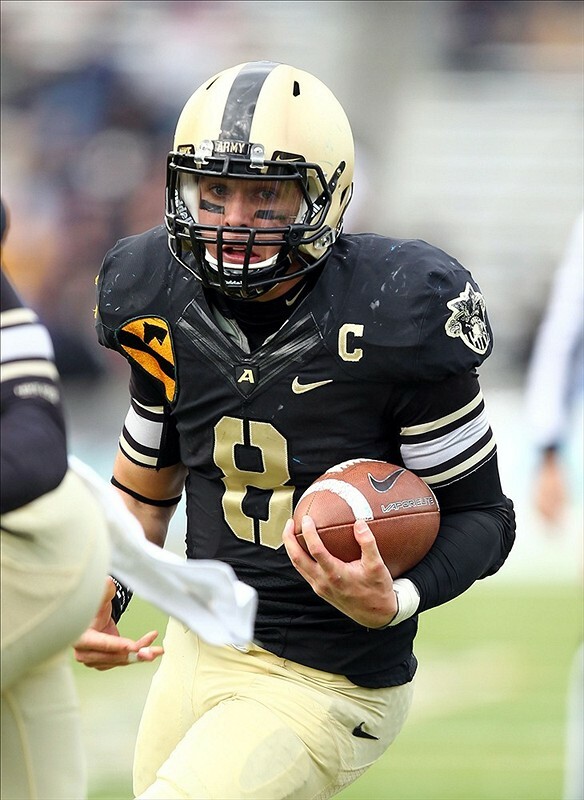 Army’s tied for 77th in that stat and in negative numbers; it’ll be up to quarterback Trent Steelman and running back Raymond Maples not only to lead the Army offense, but to keep the Army defense off the field by avoiding costly turnovers. 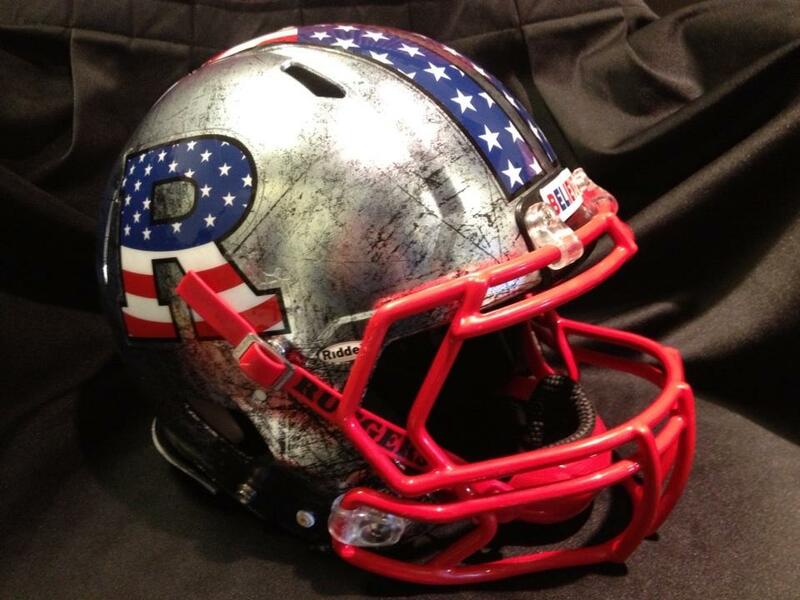 Odds and ends: Rutgers has a fancy helmet for this week as part of military appreciation festivities. It’s to your right. … Superstorm Sandy hit New Jersey hard, and RU wasn’t immune. Fans can donate to relief efforts at the game. … If you’re a sucker for Army history, check out this short piece from Joseph Cress at The (Carlisle, Pa.) Sentinel on the 100th anniversary of a famous Army-Carlisle game that featured future all-world athlete Jim Thorpe and future general and president Dwight Eisenhower.